In 1587, 117 English colonists were left, involuntarily, on the coast of what would become North Carolina. They wanted to come to the New World — had signed up with an expedition sponsored by Sir Walter Raleigh to do it — but to a place further up the Chesapeake Bay. The commander of the fleet wouldn’t take them beyond Roanoke Island — no one knows why — so they got off the boat and settled in a place with hostile locals (owing to bad experiences with previous settlers) and grim conditions. Their leader, John White, went back to England with the returning ship, for more supplies and reenforcements. 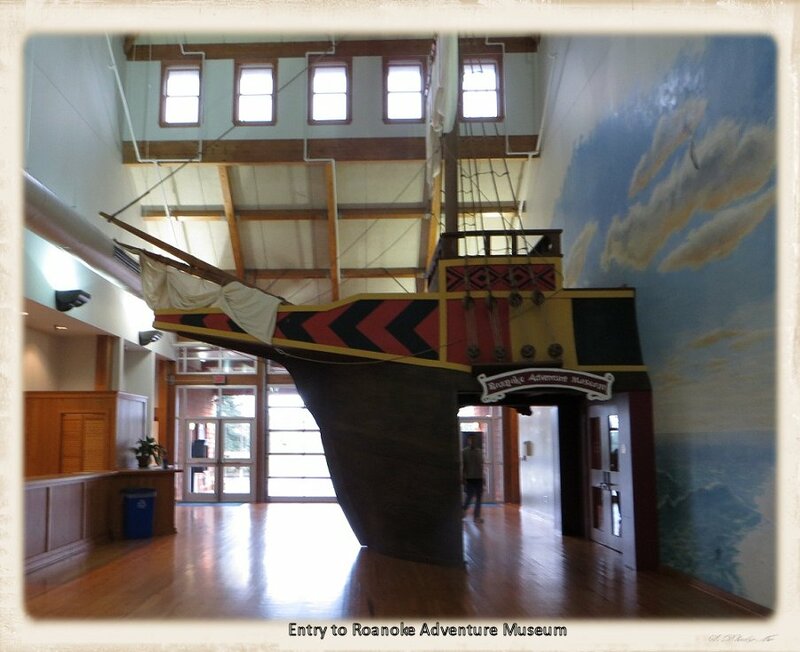 Roanoke Island has since built its economy on the story of the Lost Colony and its place as the site of the first English settlement in America (Jamestown, Virginia was the first permanent colony). 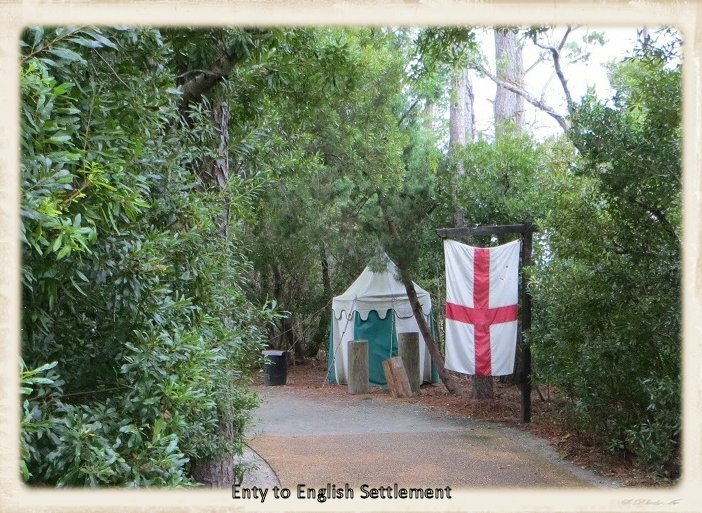 Among the tourist venues hitching itselt to the Lost Colony wagon is Roanoke Island Festival Park, which calls itself “an interactive historic site representing the first English settlement attempt in 1585.” The picky me would say that a “historic site” does not “represent.” It is. 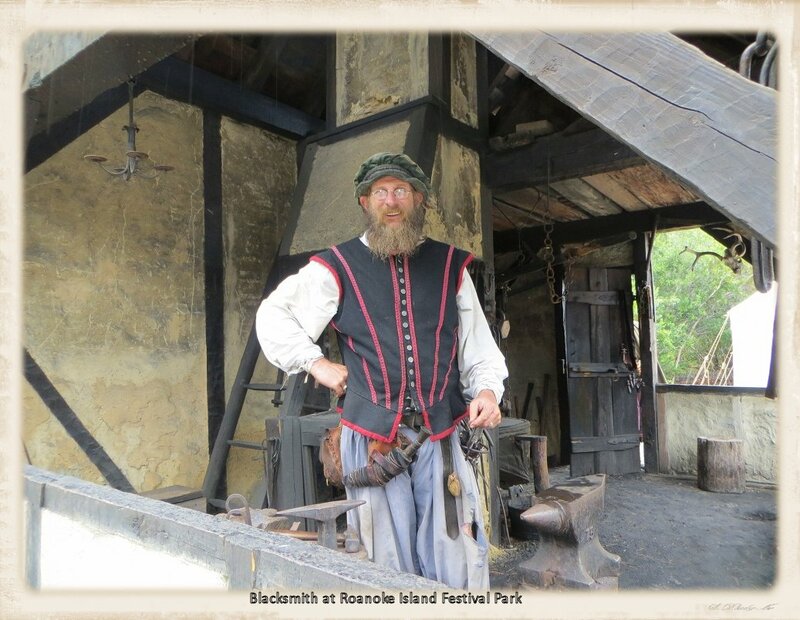 Like Jamestown Settlement, Roanoke Island Festival Park is a recreation, not a restoration. And there are few (I don’t remember any but I don’t want to say “none” because I’m not positive) historic artifacts. 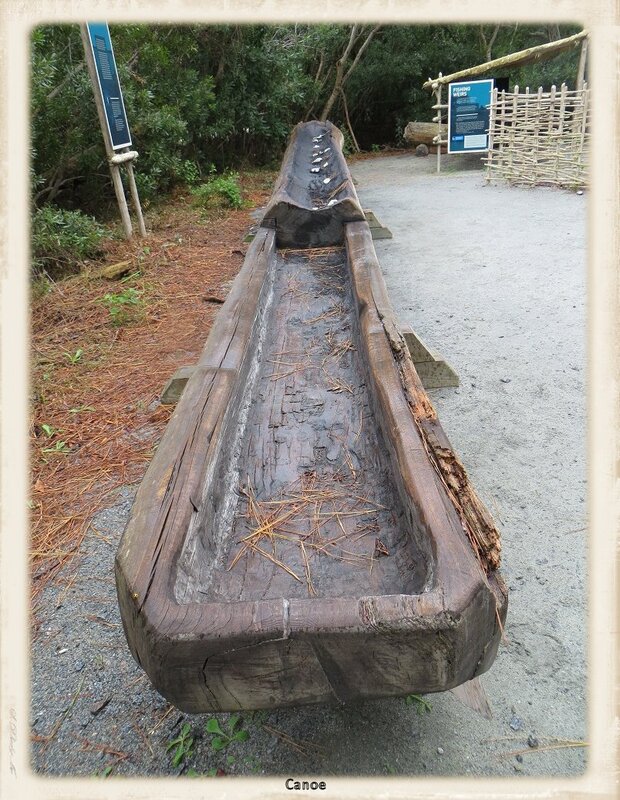 It’s an educational facility that teaches about the history of Roanoke Island. I was there in early October, when a busload of foreign exchange students was the only other tourists visible. I paid my fee in the visitors center ($10 for adults, $7 for children 6 and older), skipped the introductory movie and moved straight to the outdoor exhibits. It was drizzling and I hoped to get through it before the real rain started. It’s a small attraction — nowhere near as large as Jamestown Settlement — with three exhibit areas: a Native American village, an English settlement, and a reproduction 16th century English ship. It describes itself on its website as a “vibrant attraction” with “multiple activites” and I’m sure that’s true during the summer tourist season. In early October — hurricane season along the Atlantic coast — it’s dead. The Native American village had one Native American house (of the same coastal Algonquin type found at St. Mary’s and Jamestown Settlement), a canoe, and a gaggle of college-aged exchange students taking photos of each other next to the house. There was no staff in sight. Down the path a few steps was the Elizabeth II, a three-masted cargo ship built in the early 1980s for the 400th anniverary of the Roanoke voyages. 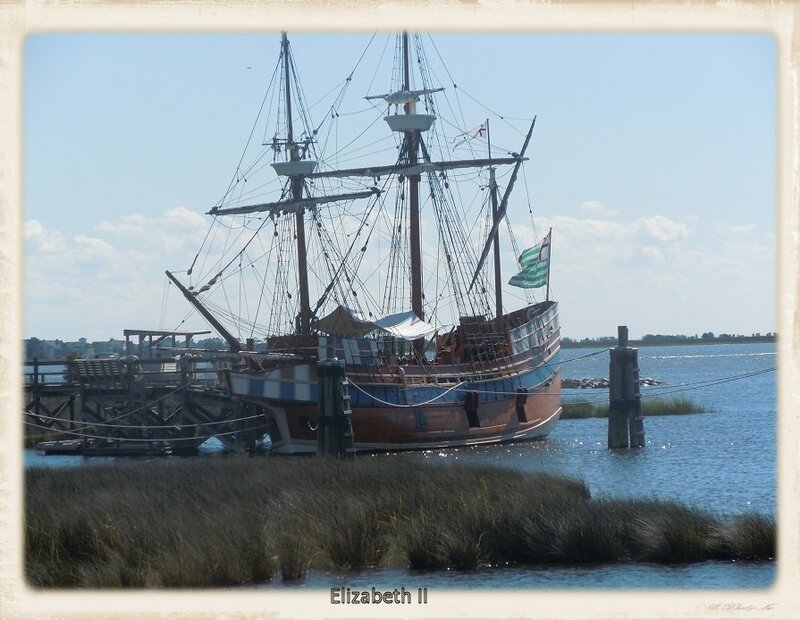 Seven ships were involved in Raleigh’s second expedition to Roanoke (the Lost Colonists were part of the third), among them the Elizabeth. 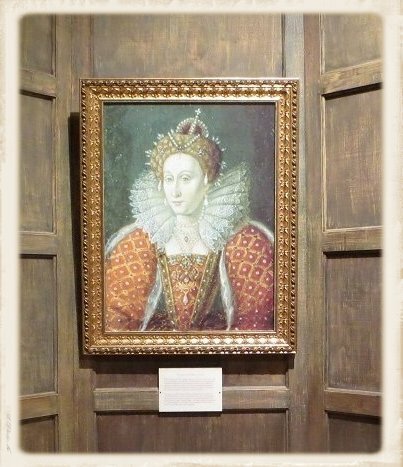 Elizabeth II is a “representation” of the 16th century Elizabeth. There were two costumed interpreters on the ship: a woman on deck dressed as a male sailor and a man below. Let me take a moment here to give a piece of gratuatous advice to U.S. sites that use interpreters: no English accents unless the interpreter really is from England. The accents I’ve been hearing at historic sites and museums lately make me want to cry, and I’m not even English. So please, for the sake of Anglo-American relations, stop with the fake English accents. The woman on deck didn’t offer any information but responded to questions. The young man below offered up a little speech about life below deck. 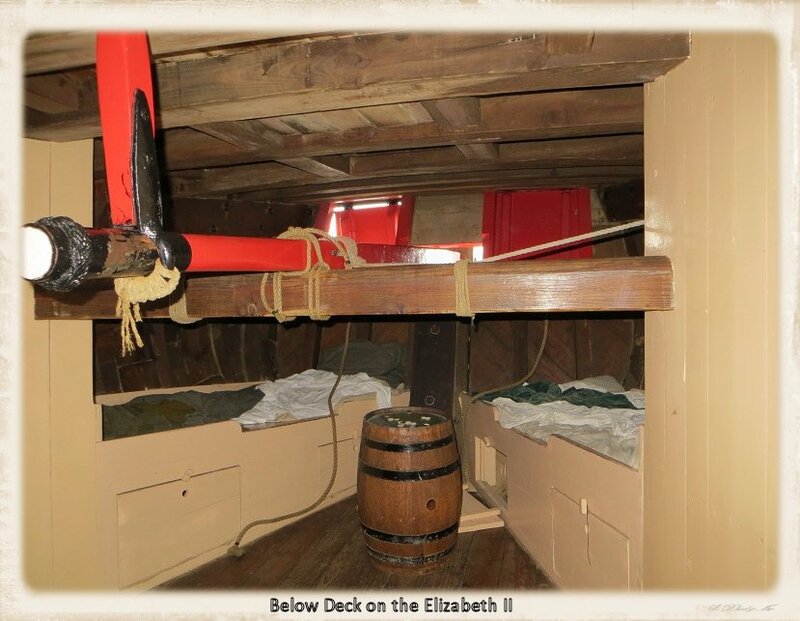 The passengers — soldiers and tradesmen — were not allowed on deck unless the ship was in port, because they’d get in the way of the sailors. There was hardly room for me, the interpreter and three or four exchange students down there. 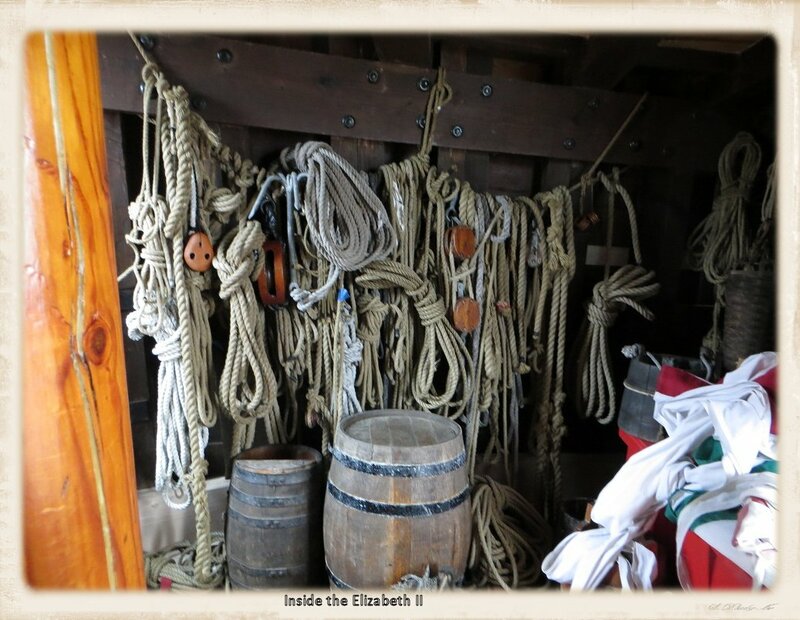 Ninety-five days below the deck of a 69 ft x 17 ft ship with dozens of men goes beyond the limits of my imagination. Or really, what I even want to imagine. 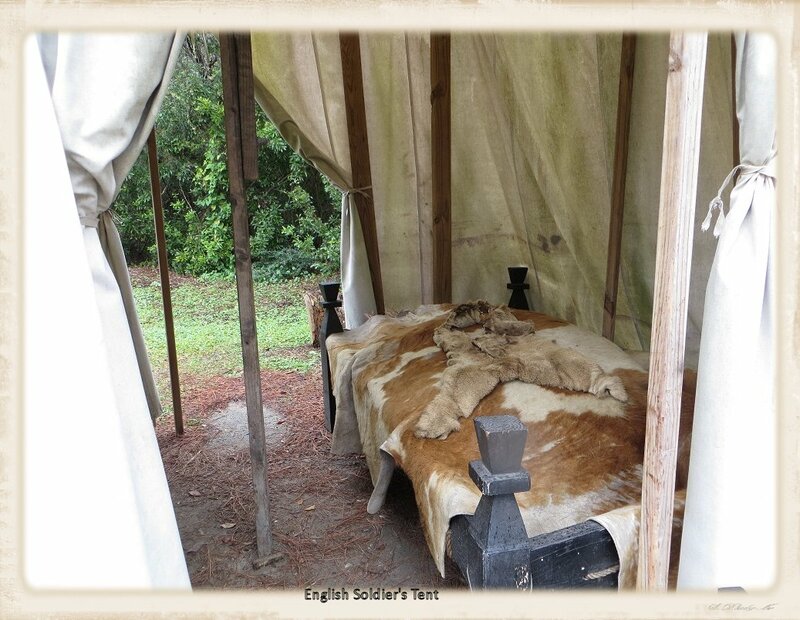 The English settlement was a tiny compound with a blacksmith’s stall, a couple of tents, and a soldier’s station with a small display of weapons. The blacksmith managed to extracate himself from the exchange students as I wandered over to his stall, to give me a demonstration. He was the most engaging of the Festival Park interpreters. I had heard him with the exchange students earlier. “Ach. Beautiful country.” How would a 16th century blacksmith know? He talked — in a believable Scottish accent, I must say — as he heated a piece of iron, pinched off the end, flatted the head, and cooled it. “It’s a rose head nail,” he explained. “I’m Scottish so I don’t get much of a chance to give a lovely lady a rose, so allow me to give this to you.” He handed me the nail with a florish. I don’t make the connection between being Scottish and not giving roses. And okay, the speech was a little corny. But…awwwww…. Especially since the only other interpreter in the area — a soldier(?) — went running when he saw me headed his way. That was the end of the outdoor exhibits. I was on my way back to the main building when the drizzle turned heavy. “I guess it’s started raining,” said an observant attendent as I went into their indoor exhibit, trailing water behind me. The indoor exhibit is an learning space aimed at children. 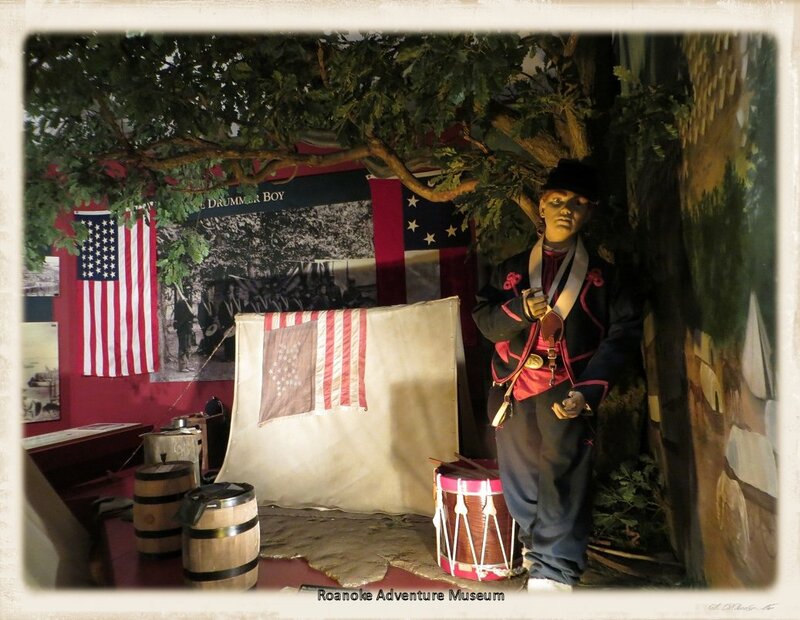 It covers not only the 16th century colonization story, but Roanoke history in general. I did a quick run through — there are interactive tableaux on pirates, lighhouse keepers, the Civil War, and town life — then hung out in their large gift shop until the rain let up. Now that I think about it, I could have gone to see the intro film instead. The general consensus on the fate of Lost Colony is that, when White’s help didn’t show up and they got desparate, they moved to more hospitable areas (although there’s disagreement on exactly where) and integrated with the locals. The First Colony Foundation, in partnership with the National Park Service, is conducting archeological digs near Ft. Raleigh, a couple of miles up the road, in an attempt to find more evidence of the original settlements. 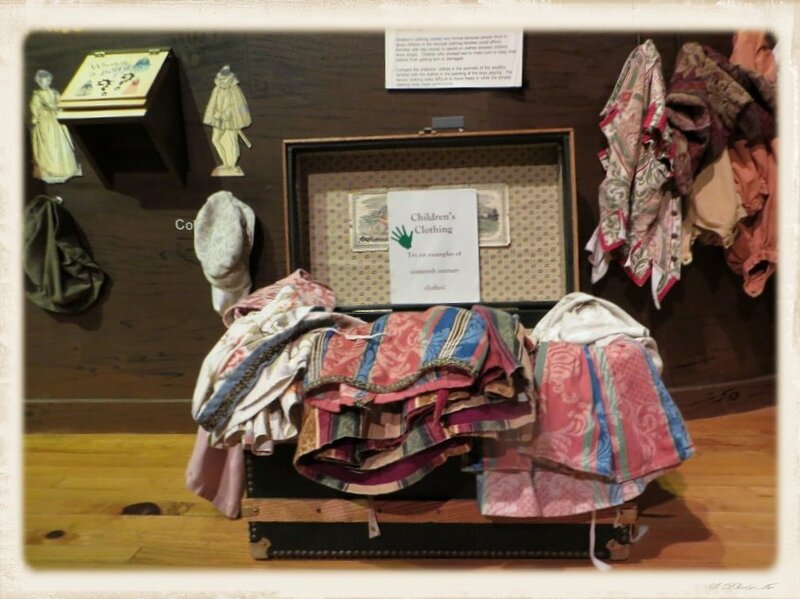 Gallery | This entry was posted in North Carolina and tagged Lost Colony, Manteo, Roanoke Island, Roanoke Island Festival Park. Bookmark the permalink. So many theories, so little hard evidence. I read an interesting alternate theory a couple of years ago that the colony might have been overrun in their weakened state by the locals, and traded off as slaves to more powerful inland tribes. I find it hard to believe that if they stayed anywhere in the area that their descendants would not have made contact with the next batch of Europeans they encountered. So many interesting theories. I like that one. Since they haven’t come up with any evidence, I suppose that it’s anyone’s guess.